The Best & Most Complete!! The Inside Outside DXA Scanning Staff from August 2017, Elydia Miles positions Hi-Lo Trainer Rocio Moran assisted by Summer 2107 UTSA Interns Raelissa Diaz with Amanda Grogan at the Hologic Discovery A DXA workstation in the Best DXA Room in the World!! 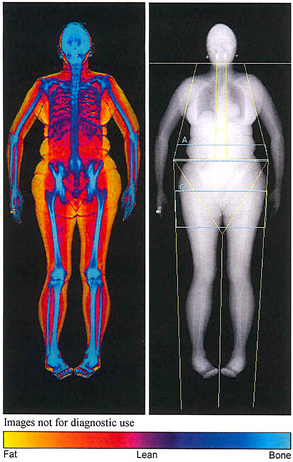 DXA Body Composition in San Antonio is an advanced radiological method of measuring your Lean Mass and Fat Mass in multiple areas of your body such as arms, legs, trunk, abdomen and hips in addition to whole body measurements. 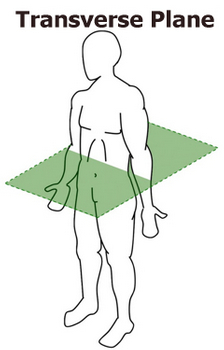 DXA is an acronym for Dual X-Ray Absorptiometry. 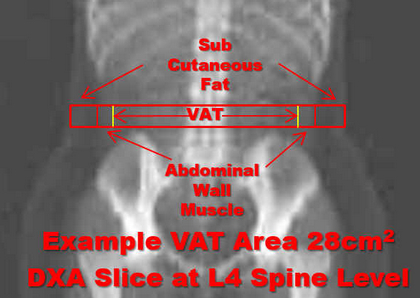 Some scanners also measure Visceral Adipose Tissue (VAT). The old nomenclature was DEXA (Dual-Energy X-Ray Absorptiometry) but DXA is the currently recognized acronym. Most DXA devices are used for Bone Density Testing which is very common, but a few also have the Body Composition Software. You should look for one that also measures Visceral Adipose Tissue such as the advanced Hologic and GE Models and also give you a color image which lets you see fat, lean and bone. 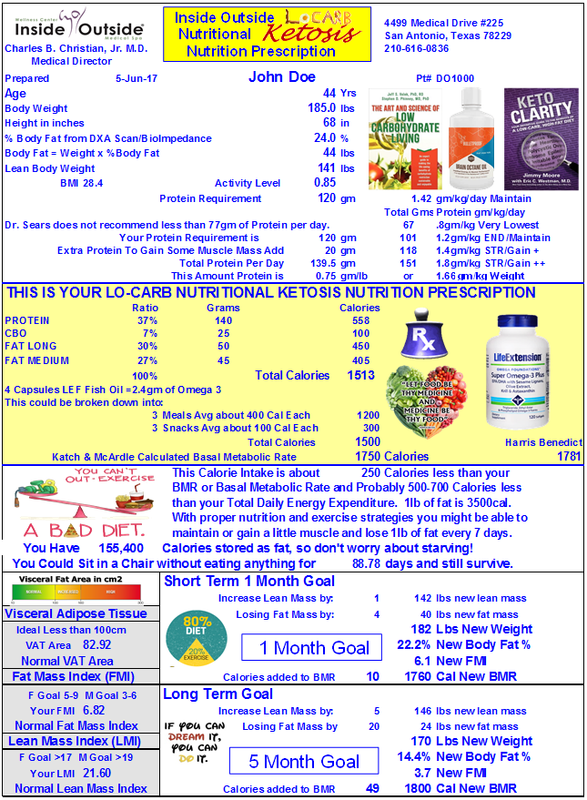 If you are doing serial scans the center performing the scans should ideally have software which easily and visually compares your scans graphically so you can follow the results of your Diet/Exercise Program. Don't accidently diet away muscle, the best way to check is DXA Scanning. want to Stop Guessing! And, you need to know about your Visceral Fat!! You may be TOFI, Thin Outside Fat Inside! Our DXA Body Composition Brochure! YouTube Video of Our DXA Scanner at Work! 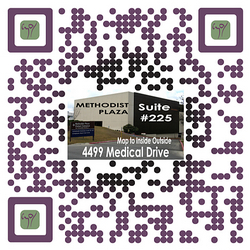 Scan can include our Modified Zone/Paleo, LoCarb, Nutritional Ketosis or Bulking Nutrition Prescription! Tells you exactly what you need to do to reach your goals of losing fat and gaining muscle! See what it would take to get to a lower Body Fat % based on your Scan Results. Stand alone, a la carte service! Use Your For your DXA Body Composition Test! Give a DXA Scan! A Great Gift Idea! can't be done if you are pregnant or think you are pregnant. Our Hologic Discovery A Model DXA Scanner (Usually used for Bone Density Testing) is equipped with the Software module that distinguishes lean mass, bone and fat (including Visceral Adipose Tissue) and calculates your total body composition. 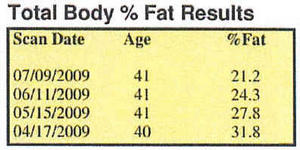 For optimal health, the average body fat should be about 16% for males and 21% for females. DXA Body Composition scanning is a very accurate method of body composition analysis and is now the Gold Standard for most research applications. Followup serial scans allow for easy measurement of your progress during your Weight Loss/Strength/Cardio/Training/CrossFit Nutrition program. 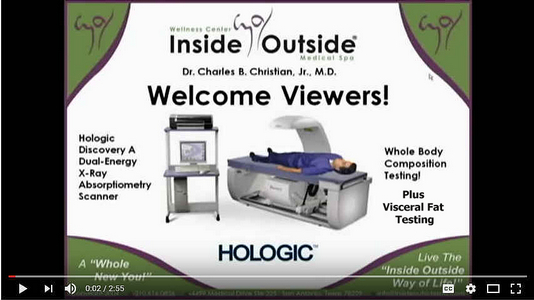 Dr. Christian is Certified DXA Operator of our Hologic Discovery A Scanner and has over 18 years experience with DXA Scanning for Body Composition and Bone Density Testing. from 2 hours outside from the Sun and Radon in the ground. 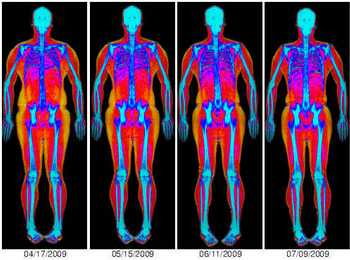 See Radiation Risks of DXA Total Body Scans. The scan analysis then takes about 10 minutes. The color report shows fat in yellow, muscle in red and bone in blue. Dr. Christian is the Radiation Safety Officer. The software can give detailed evaluations about specific body parts such as the chest, shoulders or thighs and follow your progress!!! Follow-up scans and Graphs (See Below) can show the yellow fading away and the red growing!! 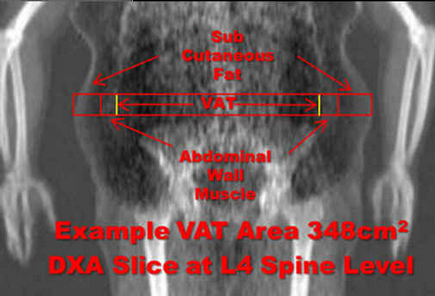 In addition, our DXA software provides analysis of Visceral Adipose Tissue (VAT) at the 4th Lumbar level which are highly correlated with CT Scan measurements. Our Proprietary DXA Comparison Tool Software allows for reporting of trends in all your body areas and changes of Visceral Fat Area, Visceral Fat Volume, Visceral Fat Mass and Waist circumference. Old scans can be re-analyzed with our current software, so we can go back and see what your measurements were in the past and compare with a new current scan. A Visceral Fat Area well below 100cm2 is the goal. Fat, especially Visceral Fat, has been called the largest endocrine (hormone producing) organ in the body. Fat that accumulates in our abdomen and around organs such as the kidneys secretes many hormones which are inflammatory and produce constant low-grade inflammation in our bodies. Inflammation is commonly seen in most pathologic processes including atherosclerosis, dementia, Alzheimer's, cancer and most chronic diseases. So reducing fat and especially the Visceral Fat will reduce inflammation in our bodies. 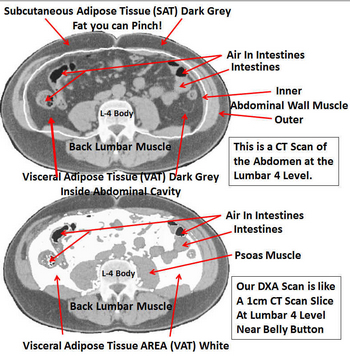 The DXA software allows us to analyze this fat with measurements virtually equal to CT Scans or MRI Scans, of course with much less expense and radiation exposure. A fat loss program such as Zone/Paleo, Low-Carb or Nutritional Ketosis will reliably lower visceral fat. Visceral Fat accumulates as our Body Fat rises and is increased with overeating, refined carbohydrates, too much fructose, stress and alcohol excess. Visceral Fat almost always is associated with fatty liver, insulin resistance and elevated glucose levels. 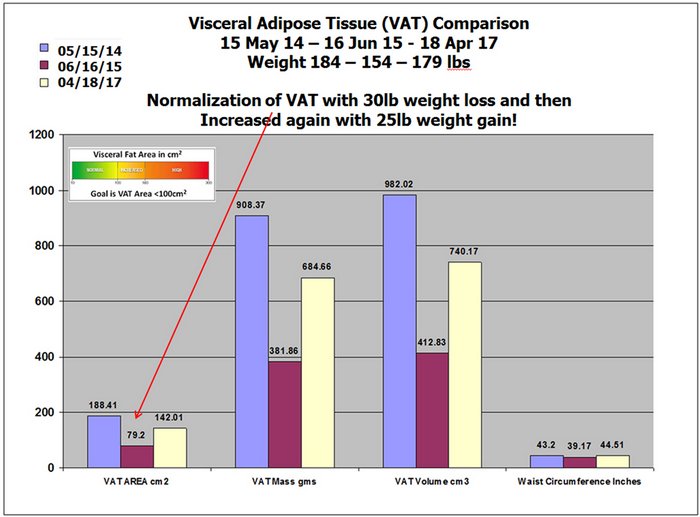 See a graph below of how we can show the Visceral Fat changes with serial scans. At the end of the scan, you will spend 30 Min with Dr. Christian and he will create for you a personalized Modified Zone/Paleo, LoCarb, Nutritional Ketosis or Bulking Nutrition Prescription. 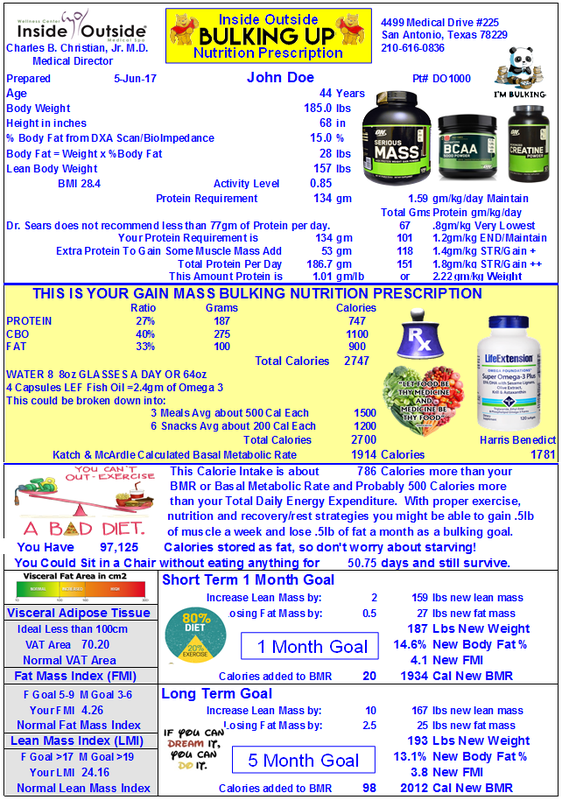 This is based on your DXA results which are directly imported into our Proprietary Excel Nutrition Prescription Program. With this tool we can create a personalized prescription that details exactly what nutritional strategies are needed to decrease body fat and gain muscle to a more desirable level. These prescriptions can be designed for Bulking, Cutting, Fat Loss/Maintain Muscle and enjoying the benefits of Nutritional Ketosis with Low-Carb, High Fat ratios. He will then show you a short PowerPoint Presentation which explains the basics of Zone/Paleo or Lo-Carb/Ketosis anti-inflammatory eating! your previous experience with "diets" and even exercise strategies which might be helpful. Even if you think you understand the nutritional aspect, this consultation with Dr. Christian will serve to affirm your thinking about the most important "Drug" you will ever put in your mouth, "Food". This consultation will create a personalized Nutrition Prescription to help you meet your goals, whether it is to lose fat/maintain muscle or gain muscle (bulk up), you will know what it takes. Dr. Christian is experienced and knowledgeable in Zone/Paleo/Nutritional Ketosis/LoCarb/Cutting and Bulking strategies for fat loss and muscle gains. Dr. Christian personally has practiced LoCarb Nutritional Ketosis enhanced with Bulletproof MCT Oil for over 3 years and monitors his ketosis with blood and breath measurements using Keto Mojo Blood Strips and the Ketonix Breath Analyzer. See Live Facebook Video of International Fitness/Figure Champion Monica Brant having a DXA Body Comp Scan and Nutrition Rx. Another Live Facebook Video when Monica returns to have her Visceral Fat Checked! 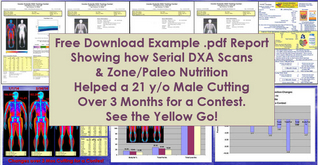 Here is an example of how serial DXA Scanning and our Zone/Paleo Nutrition helped a 21 year old male cut for a contest! 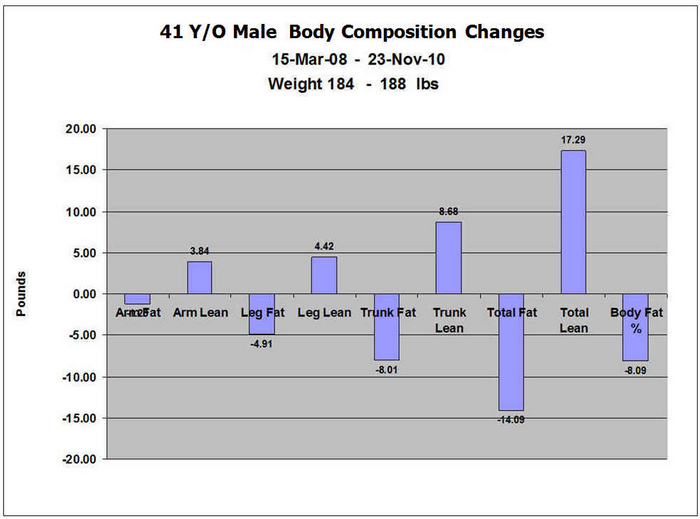 He went from 15.4% to 11.1% over a 3 month period without losing muscle mass. Download a .pdf file which explains it all! These are the baseline results for a 58 Year Old Female. 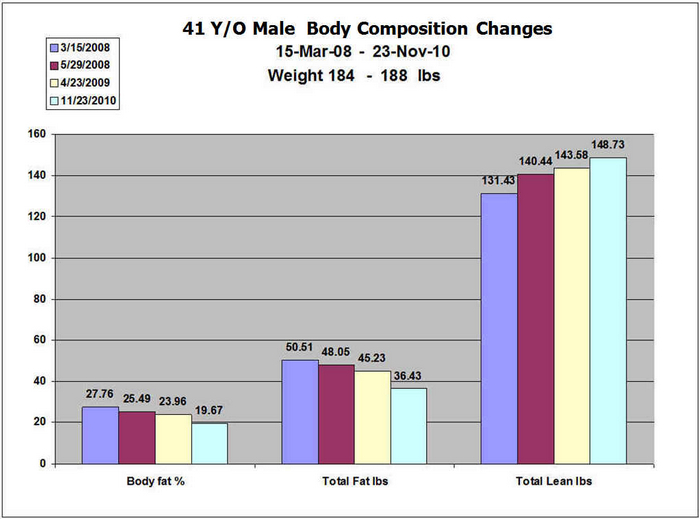 DXA Body Composition is a research level tool and can be used to help set goals for weight loss and gaining of muscle. You can watch the yellow disappear and the red increase!! This lady has a body fat % of 36.9%, too high for her age. 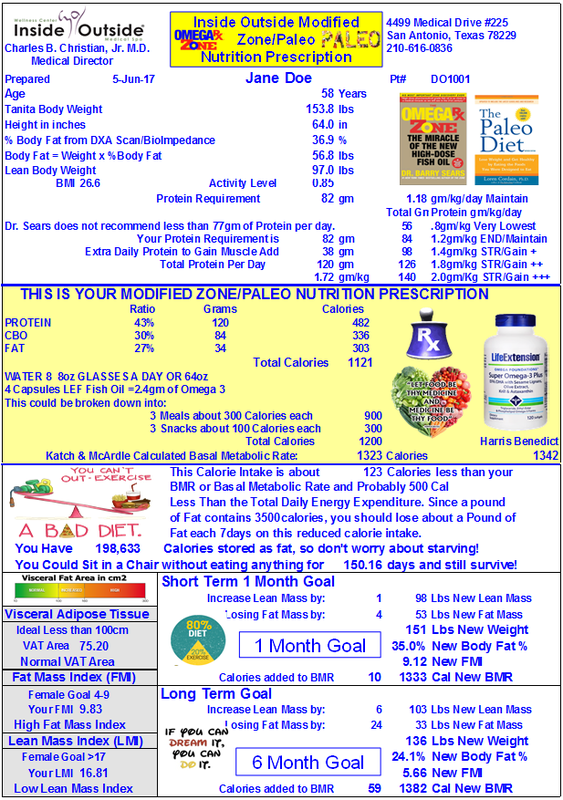 See our Modified Zone/Paleo Nutrition Prescription and how we would combine it with Hi-Lo Strength Training to get the body fat % to about 25%, much more reasonable for a 58 Year Old female!! when his body fat decreased from 31.8% to 21.2% showing the yellow disappearing!! Our Proprietary DXA Comparison Tool Software can compare scans and produce charts, graphs and images which show the progressive changes in body composition. Zone/Paleo Article "Origins and evolution of the Western Diet: Hetitleh Implications for the 21st Century"
Cordain, L et al Am J Clin Nutr 2005"
Muscle Article "The Underappreciated Role of Muscle in Hetitleh and Disease"
Hologic DXA Body Composition Site, explains uses of DXA for Performance and Weight Loss and why Hologic's DXA is the Best! 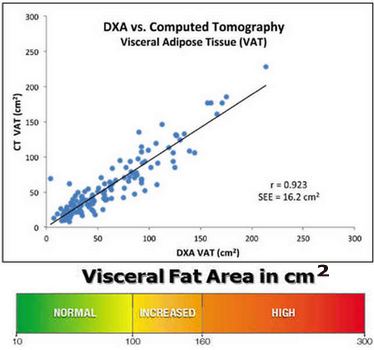 "As Americans Become More Overweight, They Seek High Tech Answers: DXA Body Composition Assessment"
and any defined sub-regions and calculates fat and lean mass in each area down to the gram as well as a very accurate estimate of Visceral Adipose Tissue. We use the baseline information to design a Zone/Paleo/LowCarb/Nutritional Ketosis/Bulking Nutrition Prescription. The prescription defines short term and long term goals to lose fat and gain muscle and helps you reach them! we can create a graphical picture of the changes of the visceral fat indicies of serial scans. Here are the results over a 3 year period of time of a 66 y/o male who had 3 scans.The Visceral Fat Area initially was high at 188cm2, decreased to 79cm2 (30lb weight loss) and then increased back to 142cm2 with a 25lb weight gain! graphical picture of the results. 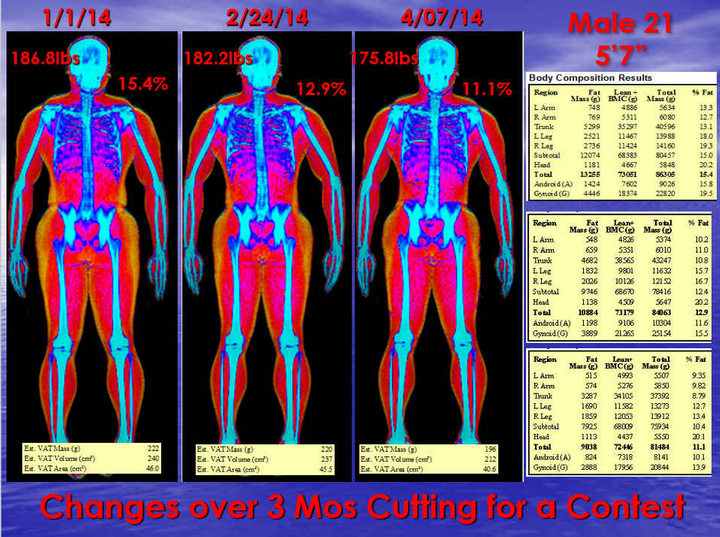 Here are the results over a 2 1/2 year period of time of a 41 y/o male who had 4 scans. 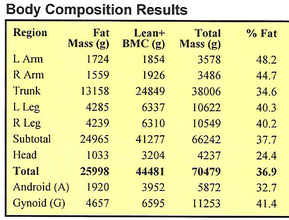 Check out our DXA Body Composition Comparison Tool! "Some Do It Different, Nobody Does It Better with Value!" "We are Radical because we insist on the Basics! 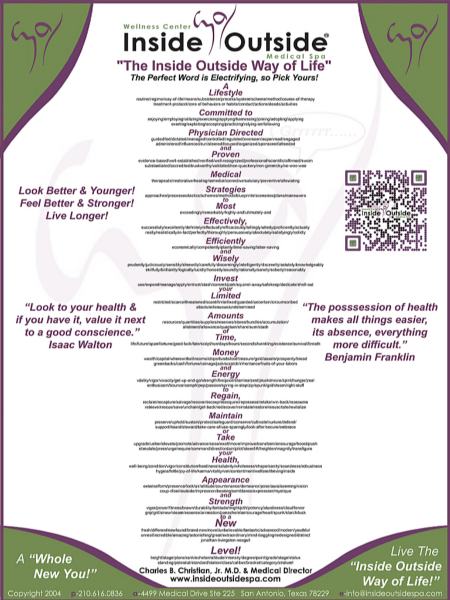 for a New Level of Health, Strength & Appearance! "The Inside Outside Way of Life!" The Poster! 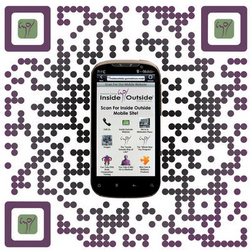 "The Inside Outside Way of Life"
Scan Inside Outside on Your Mobile Phone!! 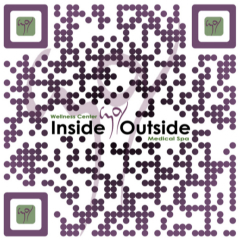 Custom QR Codes made by QRlicious! The Best of Each In San Antonio! Visit us at Facebook! Become a Fan!